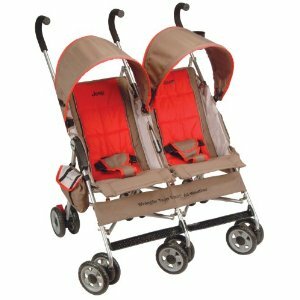 There are a few baby products made just for twins that I’d consider essential, and first on that list is a double stroller. This is also a product where you need to do your homework! Between my twin boys and their older sister, we’ve had six different strollers in three years. Three of these are single baby strollers that are reviewed elsewhere. The other three were double strollers for the twins: a lightweight umbrella stroller for travel, a tandem stroller for public outings, and a double jogger for walks in the neighborhood. 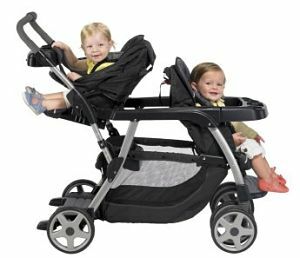 Here, I review and compare the features of the best double strollers for twins including umbrella models, tandem strollers, and double joggers. What’s Important in a Double Stroller? 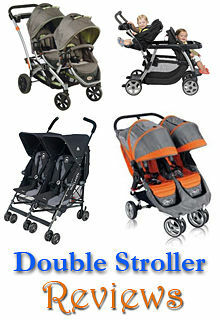 Once you have a double stroller, check out our article on must-have double stroller accessories. Since I currently own 3 strollers and use one about once a day, I’ve come to appreciate certain features of double strollers that matter more than others. Tandem or side-by-side? This is probably the most important consideration when I’m deciding which stroller to dig out. If I’m headed to a store, someone’s house, or another place without extra-wide doorways, I’ll usually opt for the tandem stroller. Granted, the twin who ends up in back usually gets fussy about it. But that’s better than knocking down a product display or, you know, passerby. Wheels for the terrain. One nice feature of jogging strollers is the big, all-terrain wheels. As you’ve probably discovered already, the standard double-wheels on most baby strollers are great on concrete but struggle with grass, gravel roads, or other bumpy surfaces. If we’re going to cross one of these I’ll take the jogger out. Comfort for the babies. The longer the planned outing, the more important the babies’ comfort is to me. Any stroller will do for a quick walk around the block. If we’re headed to a walk-a-thon or long shopping trip or all-day event, I go for the tandem stroller because it has the most padding and extra storage. Compact and lightweight for travel. We recently took a 10-day road trip and had bought our third twin stroller, a lightweight umbrella one, just for that voyage. It turned out to be really nice for day-to-day use because it folds up to be more compact and is lighter weight than our two others. There’s also the weight limit for airplanes to consider. Any time there will be lots of folding and lifting involved, go for a stroller that’s under 30 pounds. 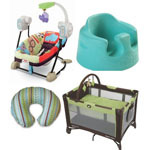 See also this article, 5 tips for choosing the best stroller, from nannycare.org. And have a look at our favorite double stroller accessory. Umbrella strollers are designed to be compact and lightweight. You’d be surprised at how cleverly these fold up even when they hold two babies at once. This is a lightweight, compact, and reasonably priced umbrella stroller for twins. It’s safety certified by ASTM, and has brakes on all three sets of rear wheels. Retractable sunshades for each seat provide some protection from sun, rain, and even well-meaning strangers. I can’t emphasize enough how useful it is to have a compact umbrella stroller that will hold both of your twins. It doesn’t take up nearly as much space compared to other twin strollers. You can throw it into a mostly-full trunk, you can gate-check it on most airlines. If you have two little adventurers, you might want an umbrella stroller made of sterner stuff. This one from Kolcraft is ready for off-road if you need it to. A 3-point buckle holds your twins securely in their seats, but has a quick-snap release so that you can get them out easily. One really nice feature is the cool-climate roll-up backs for the seats, which give you the option of creating more airflow to keep the little ones cool. Despite its rugged features, this umbrella stroller is light and compact. Plus, it folds up easily to make travel a breeze. We own two different (single baby) strollers made by Kolcraft with the Jeep label, and both live up to the reputation. The all-terrain tires are the best I’ve seen on a stroller: they can really handle thick grass, gravel roads, and other rough ground. If you have two little adventurers, you might want a folding double made of sterner stuff. 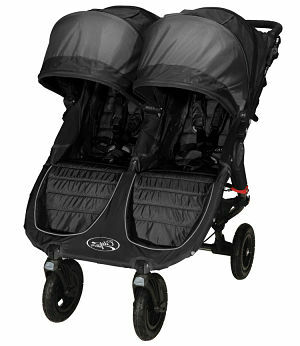 Technically, the Quattro isn’t an umbrella stroller, but it folds flat to allow for easy transport and storage. Even so, it’s full size with plenty of room for both twins. Each seat has a cupholder, tray, and its own canopy. This stroller has the one-handed gravity fold, which I love. You can also lock the two front wheels to use it as more of a jogger. Tandem strollers let one twin ride in front, and one behind. This may or may not work for your multiples, depending on their personalities. But a tandem stroller is useful for, you know, going through regular-sized doors and shopping in stores with narrow aisles. 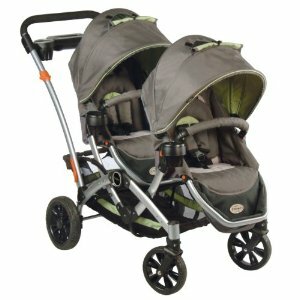 Perhaps the most popular tandem stroller for twins is made by Graco. The latest model, the Ready2Grow Stand & Ride, is an all-around tandem stroller; if you had to buy just one twin stroller, this would be it. There’s stadium-style seating, which helps the twin in the back see out better. Each seat has its own canopy and footrest. The rear seat reclines to essentially flat – I used that very feature tonight to give my younger son a bottle while we watched his older sister’s swim lesson. The ability to plug in 1-2 Graco car seats really makes this stroller versatile: you could use it for an infant and an older child, two children, baby twins, or some combination thereof. Perhaps the best feature is the one-hand fold: you push, twist, and the stroller folds all the way down and latches. It’s fast and easy, a useful thing for when you’re holding a baby in a busy parking lot. 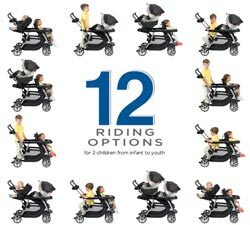 There are twelve different configuration options accommodating twins or siblings of different ages. Last but certainly not least, each seat has a storage and snack tray! Here’s a robust tandem stroller with a lighter frame. Weighing in at less than 37 pounds, this stroller has a lot of flexibility: the reversible seats can be positioned six different ways, and there’s even an attachment for an infant car seat. For me, when it comes to strollers (or minivans, or anything else), cupholders are a make-or-break feature. This stroller has four: two for the adults, and two for the little ones. There’s also a large storage basket underneath, and a small storage bin on the handle (great for keeping your keys or cell phone). 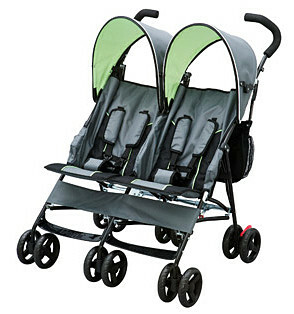 Double jogger strollers aren’t just for the fitness-crazed. True, the wheels are larger and can be locked in position to cruise at jogging speeds, but these lightweight strollers are well-suited to family outings, walks, and other outdoor activities. 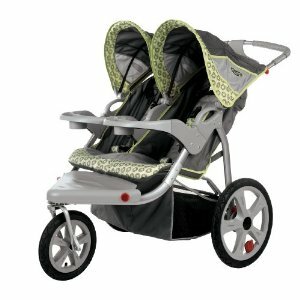 One of the most popular strollers on Amazon is the Instep Safari double jogger with swivel wheel. This stroller is designed for comfort and safety, with high-performance pneumatic tires (12″ front, 16″ rear) and a dual-trigger folding mechanism to prevent mishaps. It seats two children up to 50 pounds each (that’s like, a 4 year old) and has built-in handles for carrying the stroller when it’s folded. The manual swivel lock lets you flip between jogging mode, when a fixed front wheel is essential, and strolling mode when you’ll need to turn easily.Weighing in at nearly 50 pounds, this stroller is built for comfort and stability. True, you can easily snap the wheels on and off during transport, but there are lighter strollers out there if you do much traveling. I do like the molded parent tray with two cupholders and the slip-resistant rubberized grip. And the 110+ reviews of this stroller are largely positive. If anyone knows how to make a good jogging stroller, it’s a bicycle company. 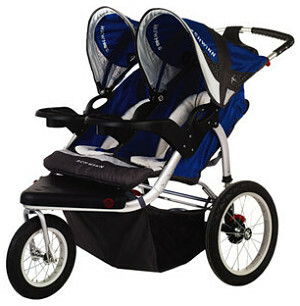 The Schwinn Turismo double jogger is a higher-end jogging stroller and it shows. Lightweight aluminum frame, independent 5-position canopies, and quick release rims are just some of the conveniences this model has to offer. The handle is rubberized (no-slip) and adjustable for maximum comfort. The seat-backs are also independently adjustable, and there are built-in speakers for your iPhone or MP3 player. The seats are truly independent, which will help keep your twins from bickering while you’re out and about. That’s a key feature that separates this stroller from most other side-by-side strollers I’ve seen. • Independent 5-position canopies to protect from sun/rain. Baby Jogger’s City series of strollers are wildly popular. They’re safe, lightweight, and easy to fold. 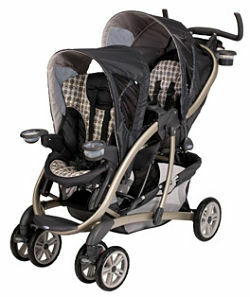 This one, the City Mini Double GT, recently won the Parent Tested, Parent Approved (PTPA) media award for baby strollers. This could easily be your everyday stroller; you can lock or unlock both front wheels for walking or jogging, respectively. Both seats fold back to a near-flat position and have mesh backs with retractable weather covers. The individually adjustable sun canopies have little peek-a-boo windows. There’s lots of built-in storage: an under-backet and pockets behind each of the seats. The Citi Mini Double will hold up to 100 pounds, but it still fits through a standard-size door. A patented one-hand quick-fold technology lets you easily collapse the stroller, at which point it weighs only 26 pounds. That’s impressive! • Unique one-hand quick fold up. If you like this article, you might want to subscribe by e-mail or RSS so that you’re notified when new content is posted. Study up! 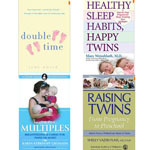 Read about our recommended 7 books for new parents of twins. 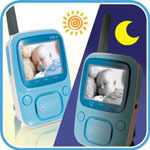 See our reviews of the latest video monitors for twins if you want to keep an extra close eye on your little ones. When your babies are teething, here are a few ways to offer some relief. Twins taking over the house? See our 6 ways to contain and entertain twins for helpful ideas. Thanks for the review but I’m still stumped at the lack of single baby strollers that offer side-by-side attachability. In other words, I could have two separate strollers attached by some locking mechanism to turn it into a twin stroller or unlocked into two separate single strollers. This would be an amazing design to have and I somehow believe they’re believe they’re available. What are your thoughts? 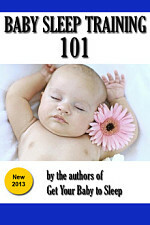 Baby Sleep Training 101 is the complete guide to establishing healthy baby sleep habits and teaching your baby to sleep through the night.